We also try to keep the formatted newsletter to a 2-page minimum, which means that we don’t list all the share items’ descriptions every week, but refer you to previous newsletters for information on items that have already appeared in your shares. Keep in mind the internet is overflowing with information, including pictures of almost everything that we grow. Also, we have two sections on our website to help you identify unfamiliar produce with color images including descriptions of appearance, taste, nutrition, uses, storage, and seasonal information. You can find this under “CSA Info” on the “Veggie ID” page and also under “Recipes”; the section is called “Produce Information Organized by Plant Part”. We already have some ideas on how to make it easier for you to use (especially an alphabetical tag list of produce), but it’s as good as it gets for this season. Please feel free to pass along any ideas you may have to make it more user friendly. GREEN, PURPLE, or YELLOW BEANS: You will receive Provider (a fleshy, tender, round pod green bean) or Royal Burgundy (brilliant purple, smooth, round, meaty pods; add stunning color to salads when used raw; pods turn dark green when cooked; excellent fresh or frozen) or Rocdor (long, slender, yellow bean; meaty, firm texture and no watery taste). See Week 7 newsletter for usage and storage information. CARROTS (Yaya): bright orange root with a blunt tip; extremely sweet and juicy; excellent in sweet desserts. Greens are delicious in salads and soups. (See “Carrot Top Soup” recipe on our website.) See Week 9 for usage and storage information. CUCUMBERS: long, cylindrical, green-skinned fruit of the gourd family with mild, crisp flesh. The thin skin doesn’t need peeling, unless waxed for longer shelf life in stores. See Week 9 for usage and storage information. 1. Spearmint– leaves are bright green with mild flavor and fragrance; used in both sweet and savory dishes and in alcoholic drinks, such as Mint Juleps or Mojitoes; good as a hot or iced tea. See other “Mint” recipes in “A to Z” cookbook. 2. French Sorrel–slightly tart, lemon-flavored green; excellent for salads, soups, and sauces; can be used in omelets, breads, or cooked as a side dish; leaves are shaped like spinach, but paler green in color; high in vitamin A and contains some calcium, phosphorous, potassium, magnesium, and vitamin C; refrigerate in plastic bag for up to 3 days. 3. Rosemary—pine needle-like leaves used with potatoes, bread doughs, risottos, mixed vegetables, and meat dishes, especially lamb, as well as in sweet dishes such as lemonade, creams, custards, and syrups; very strongly flavored. 4. Sage— an herb from an evergreen shrub in the mint family with long, narrow, grayish-green leaves; a musky aroma and a warm and spicy taste; used in making sausages, stews, breads, and teas; enhances meats, vegetables, salads, pickles, and cheese. *Genovese Basil—an herb with sweet, spicy, shiny, green leaves. We supply it with root attached, so it will last longer when stored in a jar, vase, or glass of water on your counter or table top. U-PICK FLOWERS (only available on the farm): Every summer we plant a variety of flowers for drying or fresh bouquets. Picking flowers is labor-intensive and transporting them is difficult, so we are not able to bring cut flowers to all the distribution sites, but we do encourage you to come to the farm to pick your flowers each week. Due to our dry season our flowers have been growing very slowly, so we are asking you to only pick 7 to 10 stems. Whenever possible if you can donate $1 (or more) that will help to pay for some seed and labor costs. More information about u-pick flowers is in the “Announcements” section. KALE (Green Curly): well-ruffled, curly green leaves on green stems; this variety makes a good, roasted “kale chip”. See Week 1 for usage and storage information. How to store: not for long storage; wrap in damp towel or plastic bag in fridge for 2 to 7 days. GREEN BELL PEPPERS: large blocky cells with fruity, sweet flavor. See Week 10 newsletter for usage and storage information. How to use: eat raw for best nutrient retention; can be added to soups, stews, omelets, quiches, stir-fries, etc. ; excellent stuffed. How to store: refrigerate unwashed in hydrator drawer for 1-2 weeks. Peppers can be easily frozen by washing, chopping, and placing in freezer bags. Also, peppers can be dehydrated or dried. How to use: Handle hot peppers with gloves, and cut on glass plate. Often roasted, chopped, or stuffed for appetizers; also used in jams, salsa, and pickles. See today’s newsletter recipes. POTATOES (Red Norland): smooth, red skin and white flesh; great baked, boiled, or roasted. See Week 8 on storage information. SPICY GREENS MIX (Elegance): a beautiful salad mix ranging in color from dark and bronze red to bluish green; combination of flavors and textures include Pac Choi, Red Mustard, Mizuna, and leaf broccoli. SUMMER SQUASH/ZUCCHINI: You will receive some variety of Yellow or Green Zucchini (gourmet golden or green zucchini with uniform, cylindrical fruits) or Yellow Crookneck (long, curved neck with a sometimes bumpy, yellow skin; buttery flavor and firm texture). See Week 5 for usage and storage information. TOMATOES: Our tomato season is finally here with gusto, so you may choose from several of the following “heirloom” (See feature article on “heirlooms”) tomatoes: Brandywine (heirloom tomato with deep pink skin and smooth, red flesh; delicious flavor and large fruit; large, heirloom, beefsteak tomato–often over 1 lb.–with a deep pink skin and smooth red flesh; known as one of the best-tasting tomatoes), Rose (deep pink, heirloom, medium-sized tomato, which is meaty and flavorful), Cherokee Purple (heirloom, medium-large, flattened globe fruit with color as dusky pink and greenish blush), Japanese Black Trifele (unusual pear-shaped, heirloom tomato with burgundy, greenish color and excellent, rich flavor), or Pruden’s Purple (early Brandywine type; vivid dark pink, heirloom tomato with smooth, crimson flesh; delicious flavor and large fruit–1 lb or larger). **We pick heirloom tomatoes slightly green to prevent splitting and damage, while transporting. Heirlooms are softer and more perishable when ripe. Best to store upside down at room temperature until completely ripe. 1. VACATIONS or OUT OF TOWN: Please remember to contact us at least by Sunday to make changes in pick up days or locations. Also keep in mind that changes need to be made within the same week (Sun.-Sat. ), not into the next week of distribution. 2. U-PICK FLOWERS: Some of the flowers are ready in the u-pick flower garden. You may pick 1 bouquet with 7 to 10 stems per household for “free”. This means that if you are splitting a share, each household can pick a bouquet. If you are able to help us out with our seed costs, we would like to encourage anyone to donate $1 or more when possible. Extra bouquets will cost $4. You may want to bring a vase or a jar to keep your flowers fresher on the ride home! We do have many quart-size yogurt containers for flower pickers to use as temporary vases. Please call ahead if you plan to pick on other days besides Farm Distribution Days (Wed. and Fri.), so we can make sure someone is around to help you. It’s not a loom for your heirs, as you might think. Heirloom fruit and vegetable varieties are hundreds and sometimes thousands of years old. Heirlooms differ in shape, color, size, flavor, and storability, but they all share one characteristic– their seeds can be saved one season to plant in the next. Heirloom varieties have been bred by local farmers and gardeners over many generations and have been established as stable varieties that grow “true to seed“. These varieties are special, because they have been adapted to certain climates over a long time. Heirloom vegetables are often more flavorful than hybrid vegetables. Hybrids are bred for high productivity, disease and pest resistance, drought resistance, and hardiness. While these traits are undeniably helpful, they often come at the cost of flavor. In addition, farmers cannot save seed from hybrid crops, as they are unstable crosses from two different varieties. In summary, heirloom crops are beneficial to small farmers and home gardeners, because their seeds can be saved to plant again. They have better flavor and are more unique than hybrids, although they can be less hardy and prone to diseases. 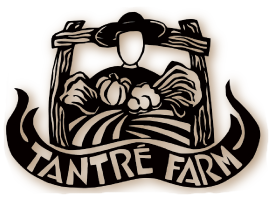 At Tantré Farm, we grow both hybrid and heirloom crops. Some of the crops we grow from heirloom seeds are tomatoes, eggplants, peppers, winter squash, potatoes, onions, kale, beans, turnips, and radishes. Sometimes we will have some varieties of heirlooms only on the market tables, since we may not have a lot of them available. We’ll try to let you know when you are getting heirloom produce in your share box. *Keep in mind the following websites–www.epicurious.com, www.cooks.com, www.recipes.com, www.tantrefarm.com. 1. Cut tomatoes into wedges. Toss with finely chopped shallots, then splash with lemon juice and extra-virgin olive oil. 2. Cut tomatoes in half lengthwise. Remove center of each, and fill with a large basil leaf and a chunk of fresh mozzarella cheese. Drizzle with purchased garlic-infused oil, and wrap in foil. Roast on an outdoor grill for five minutes. 3. Cut tomatoes in wedges. Shower with grated Parmesan cheese. Top with fresh oregano and a drizzle of olive oil. 4. Cut tomatoes into chunks, and place in blender. Add a pinch of sea salt, a few fresh basil leaves and several ice cubes. Blend until smooth and frothy for a refreshing drink. 5. Cube tomatoes and firm ricotta salt or feta cheese. Toss with cooked orzo (rice-shaped pasta), fresh mint and a favorite vinaigrette. 6. For bruchetta, top grilled Italian bread with a mixture of chopped tomatoes, minced garlic, extra- virgin olive oil and balsamic vinegar. 7. Toss arugula with chopped tomatoes, orange segments, basil and toasted pine nuts. Dress with olive oil, orange juice and a splash of wine vinegar. 8. Slather a thick slice of white bread with good mayonnaise. Cover with thick slices of juicy tomatoes. Sprinkle with coarse salt and Szechuan pepper or some cracked mixed peppercorns.